It may be a famous 24-hour eating hole but my favourite time to go there is in the late morning. To be greeted with a bowl of steaming hot soya bean milk and freshly fried you tiaos (dough sticks similar to churros but minus the sugar) is a great way to start the day. Try dunking the you tiaos into the hot milk – it soaks up the milk so that its altogether moist, sweet and offers a bit of a crunch all in one bite. 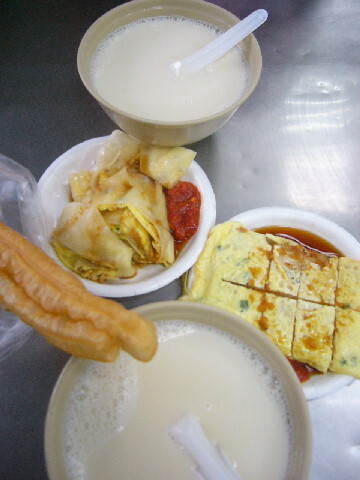 The soya bean milk comes either sweet or savoury – simply order to your liking. Other breakfast items I love here are the dan bing (a thin pancake, almost like a crepe, with egg), fan duan (a sticky rice roll with you tiao and pork floss stuffing), fried carrot cake and on occasion, the xiao long bao (steamed meat dumplings). Yong He is quite an institution in Taipei with many branches and an equal number of copy-cats. Make sure you visit the mothership on Fushing South Road.